The former Labour leadership favorite announced his bid to run earlier this month but withdrew days later after experiencing “unexpected” media scrutiny. Kendall was the first candidate to openly declare her interest in becoming the new Labour leader after Ed Miliband resigned following the party’s humiliating election defeat. Andy Burnham, Yvette Cooper and Mary Creagh are also standing. “She has no compunction in moving Labour beyond our comfort zone and is determined to build a team ready to chart a route forward,” he told the magazine. Not only did Kendall receive backing from Umunna, she also won support from the rest of his team, Emma Reynolds, Jonathon Reynolds and Stephen Twigg. “The party must move beyond its comfort zone and find new ways of realizing its age-old goals of equality and freedom,” Umunna added. After the full statement was released on Twitter, Umunna became a trending topic. Many accused him of being a “hypocrite” who has “no credibility” in endorsing another Labour leader after withdrawing his bid. “Of course Chuka Umunna is backing Liz Kendall. Rightwingerds of a conservateather flock torygether,” another user said. Wow. Chuka Umunna and his entire team back Liz Kendall. Massive news. Of course Chuka Umunna is backing Liz Kendall. Rightwingerds of a conservateather flock torygether. Journalist and author Will Black said “Chuka Umunna is wrong” as the chances would be slimmer for Labour winning another election with Kendall at the helm. “She’s David Cameron in a dress, nobody needs that,” Black said on Twitter. “Not sure that Chuka Umuna, who threw his hat in the ring and then ran away, has much credibility in choosing the Labour leader,” Black said in another tweeted. Chuka Umunna is wrong. Labour isn't going to win an election with Liz Kendall. She's David Cameron in a dress. Nobody needs that. Liz Kendall and Chuka Umunna are everything that's wrong with Labour. If I wanted right-wing policies I'd join the Tories. Blairism is dead. 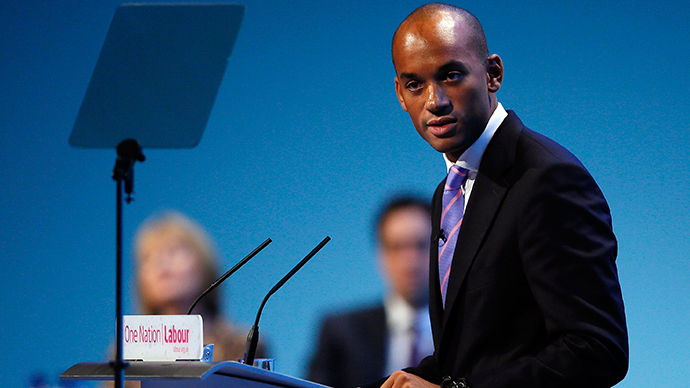 Chuka Umunna backs Liz Kendall? Color me unsurprised: two tedious Tory turncoats in a pod. I was wondering if Liz Kendall was the worst choice for the Labour leader's job. Chuka Umunna's backing has confirmed it. “Chuka Umunna backs Liz Kendall? Color me unsurprised: two tedious Tory turncoats in a pod,” another user said. However another user was supportive of Umunna’s endorsement for Kendall. “Don’t tell me she’s any worse than anybody else and about time Labour had a woman leader,” she said. “Chuka Umunna has probably just waved goodbye to a position in Andy Burnham’s shadow cabinet,” another user said. Chuka Umunna will also be endorsing a deputy leadership candidate in the coming days, I'm told.